Location: Landhuis Bloemhof, Sta. Rosaweg #6, Curaçao. Time: Tuesday - Saturday from 9 AM to 2 PM. 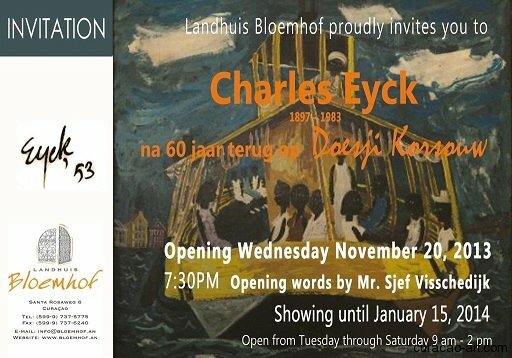 Landhuis Bloemhof in Curaçao is currently showing the exhibition “Charles Eyck after 60 years back in Doesji Korsouw”. 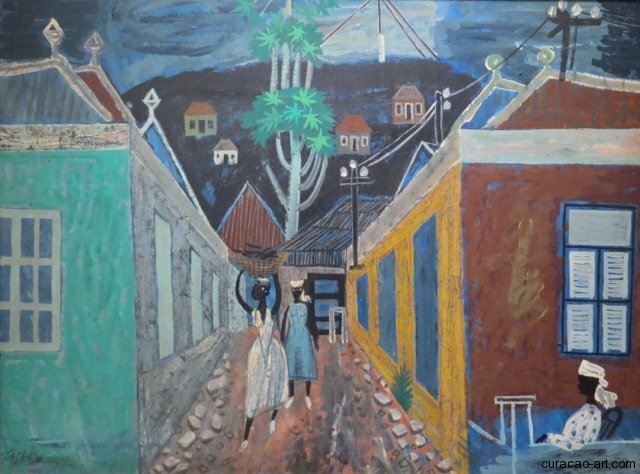 Sixty years ago, in 1952, the renowned Dutch visual artist Charles Ecyk (1897-1983) stayed in Curaçao for a period of several months. He came to the island on invitation by doctor Chris Engels (1907-1980) and during that visit also spent a few weeks in Bonaire. 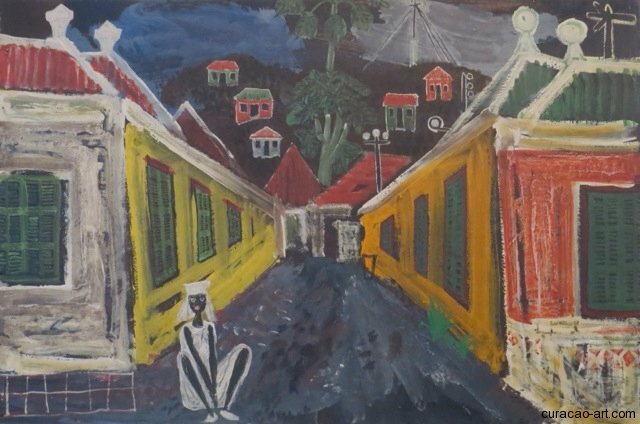 His sojourn was very productive, artistically speaking, because he spent his time painting, drawing, experimenting with tiles and even created a few monumental art pieces like the tile-scene on the south side of the St. Elisabeth Hospital. When he left in 1953 he observed in an interview that he had worked very hard but also had met many new friends. 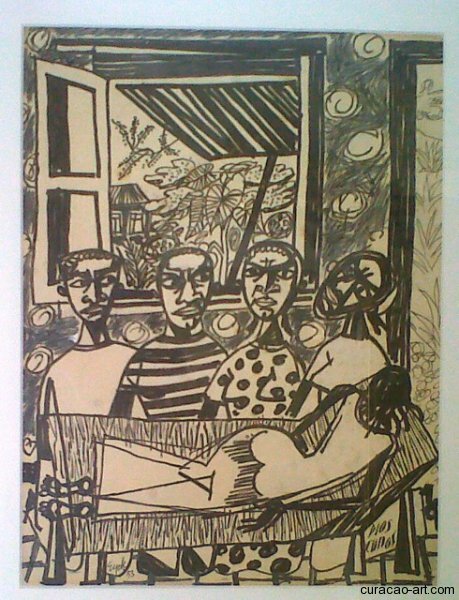 Charles Ecyk was deaf and dumb, and therefore continually sketching and writing. 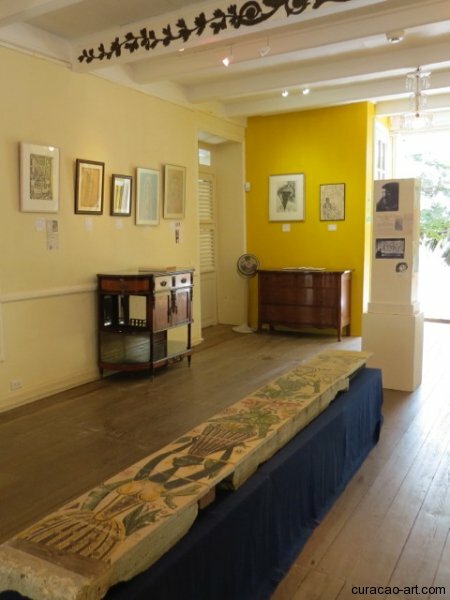 In this way he also documented all his impressions of his visit to Curaçao and Bonaire: the picturesque alleys in Punda and Otrobanda, the setting sun, the colorful houses in the city and in the countryside. But most importantly, he also depicted the common people in his paintings. This was very unusual in the early Fifties and nowadays undoubtedly lends an added value to his oeuvre from this period. His paintings and drawings show the pedestrians in town, like the women carrying baskets filled with fish on top of their heads. 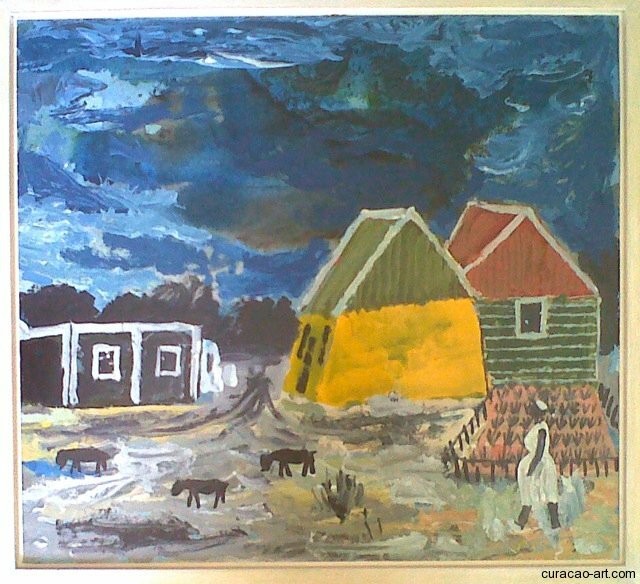 Charles Eyck also painted the houses in the countryside, with the families around them. 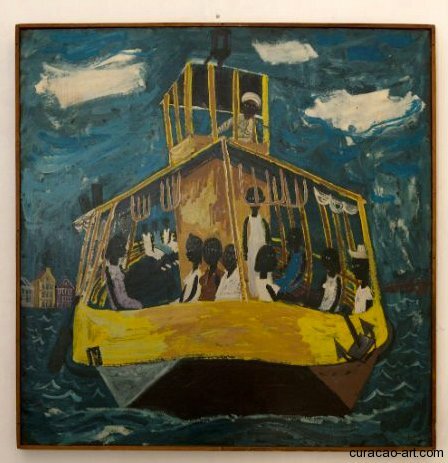 In much the same way the ferry, carrying passengers between Otrobanda and Punda, caught his artistic eye. A striking drawing in the exhibition shows a scene inside a cottage where two women and two men are kneeling beside a bed, on which a woman lies, face down. The figures around the bed all have a serious look on their faces, and although they must be concerned about the woman in the bed, not one of them is looking at her. Instead the men are gazing at the women while one woman is looking up and the other one is staring at the viewer. A small sign in the lower right hand corner reading ‘Dios cu nos’ (God help us), stresses the despair of the situation. It is mostly the expression on the four faces that gives this drawing such an intense atmosphere. 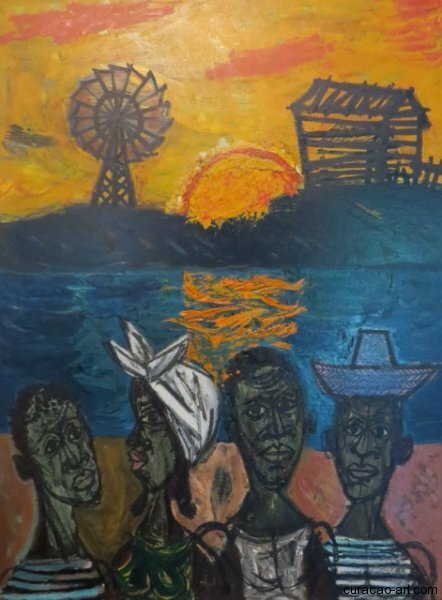 Most of his pieces show his unconcerned observations and interpretations of daily life on the island, as an outsider and a newcomer. 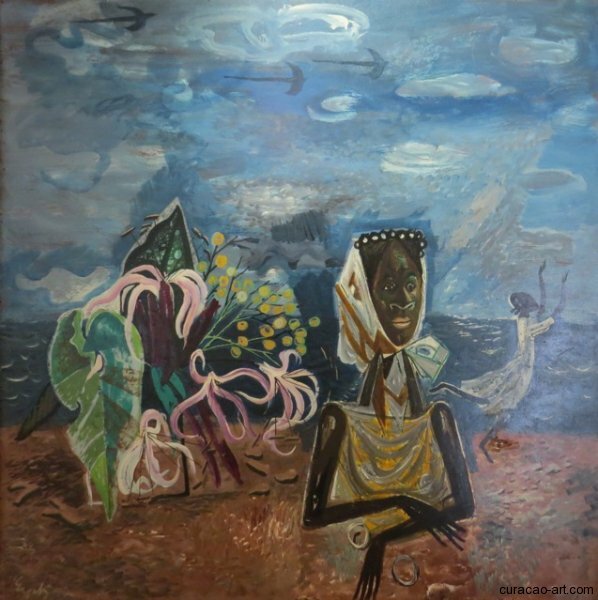 The overview exhibition “Charles Eyck after 60 years back in Doesji Korsouw”, was opened on November 20, 2013, by art collector Sjef Visschedijk. 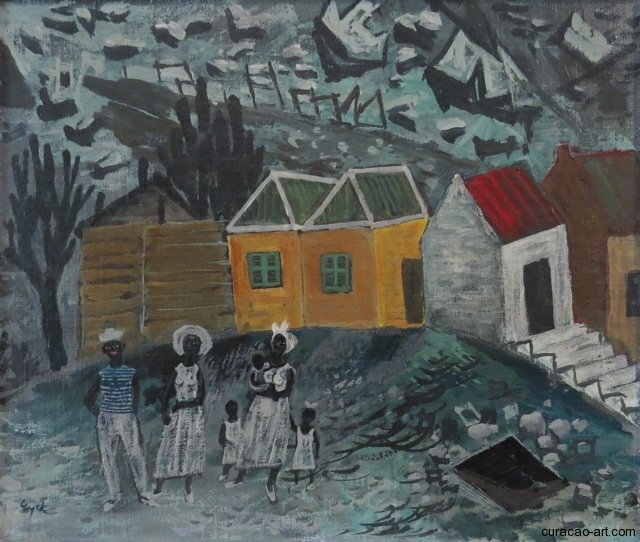 In the exhibition title, the Papiamentu words Dushi Kòrsou, meaning ‘delightful Curaçao’ are spelled phonetic, like the artist spelled it back in 1952. The spelling for Papiamentu was standardized in 2007 when it became an official language in Curaçao. Most art pieces on display are on loan from private collections, but some pieces are available for purchase. The exhibition ends on January 15, 2014. Landhuis Bloemhof is open from Tuesday till Saturday, opening hours: 9 AM till 2 PM.